From the moment of birth, you plan for the day your child will go off to college. From the moment of birth, you plan for the day your child will go off to college. And for years, there's much discussion about getting ready, but nothing really prepares you for the day you drop her off and drive away. Move-in day was for me (and my husband) one of the most exciting and difficult days – a day I will never forget. It probably ranks pretty close with the day Matty was born. I write this post four days since we left Matty in Delaware, and I think my laptop keys may still get a little damp. What does any of this, you may ask, have to do with PR? Why when PRWeek asked me to blog did I not write about converged media or some other burning industry topic? Because I believe to be a successful businessperson is to be a well-rounded individual -- and not to be afraid to freely share stories and experiences with colleagues and co-workers that show another side. I am proud to be the CEO of Zeno Group and as proud to be a mother, wife, daughter, and sister. And all these roles together make me who I am – at work and at home. Pulling up to Matty's dorm, seeing her new home, and watching her and her roommate begin to confidently and somewhat systematically unpack and organize their new life was wonderful and surreal. But this is what we raise our children to be – independent individuals who are ready to begin forging their own way, mistakes and all. Matty and her roommate Allie were determined to get some semblance of order before their first activity as college freshmen later that night. Matty did her thing, and I took my cues from her on where to help. I helped hang up clothes, sharing a trick or two on how to double up on one hanger for more space; we found just the right spot for clean towels and a special monogrammed laundry bag. I figured out how the under-the-bed shoe bag works, noting that her rather large platform shoes – there's the apple and the tree again -- needed to be handled separately. We were all very excited when the printer went on and the small TV was put in just the right spot for some upcoming Netflix nights. And then it was time to go. Matty didn't say so. We felt it. We had done our part, and Matty was clearly beginning to settle in. So we all walked to the car and began our goodbyes – a MOM-ent I will never forget. Earlier in the day, Richard Edelman emailed me. His advice: “If you cry today, you are normal.” While I knew that, I loved getting that note from him on many levels. During orientation, the school psychologist told the parents – say goodbye and don't let them see you cry. And I say, why not? My mother wanted nothing more for me and my sisters than to be strong, independent women. I have tried to give my daughters the same. Fearless does not mean tearless. Showing and sharing emotions is an important part of any relationship, at home and at work. Back to the parking lot. A tight, tight hug ensued – for some three or four minutes. Big wet tears flowed from me to her, down our faces, and into each other's shirts – and some laughs in between, too. And then it was my husband's turn. Repeat. And then one big group hug. Our baby girl back in our arms getting ready to fly. Make no mistake. These are happy tears with unspoken words woven in. The next morning, I awoke to a priceless text picture of Matty and her new friends, fearless bracelet firmly in place. There was a big smile on her face that quickly traveled to mine. I miss Matty terribly but am excited for all that's to come -- for her and for us. 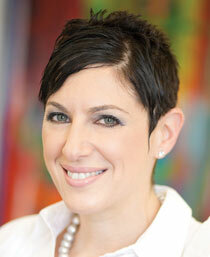 Barby Siegel is CEO of Zeno Group.